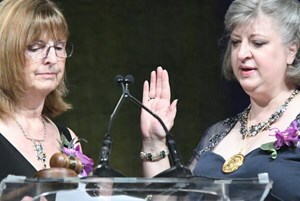 Kendi L. Hensel, DO, PhD, FAAO, of Fort Worth, Texas, was installed as the president of the American Academy of Osteopathy (AAO) on March 16 during the AAO’s annual Convocation in Orlando, Florida. Before becoming president, Dr. Hensel served for one year as the president-elect of the AAO, the nation’s largest medical society devoted to fostering neuromusculoskeletal medicine and osteopathic manipulative medicine (NMM/OMM). Dr. Hensel is an associate professor in the Department of Osteopathic Manipulative Medicine at the University of North Texas Health Science Center’s Texas College of Osteopathic Medicine. In 2011, she completed a National Institutes of Health–funded study on OMM in pregnancy. In 1998, Dr. Hensel graduated the from Oklahoma State University College of Osteopathic Medicine in Tulsa. She completed a combined residency in family practice and NMM/OMM at the University of New England College of Osteopathic Medicine in Biddeford, Maine, and she is certified by the American Osteopathic Board of Neuromusculoskeletal Medicine and the American Osteopathic Board of Family Physicians. In 2009, Dr. Hensel received her PhD in OMM Clinical Research and Education from the University of North Texas Health Science Center, and in 2018, she became a Fellow of the American Academy of Osteopathy (FAAO), an earned degree signifying exemplary scholarship in osteopathic medicine. Dr. Hensel is one of only 85 physicians who have earned the degree since it was established in 1978. Dr. Hensel has served on the AAO’s Board of Trustees and the American Osteopathic Association’s Bureau of Osteopathic Clinical Education and Research, and she is an associate editor for The Journal of the American Osteopathic Association. In 2018, Dr. Hensel was appointed to the National Institutes of Health’s National Advisory Council for Complementary and Integrative Health. She chairs the American Association of Colleges of Osteopathic Medicine’s Education Council on Osteopathic Principles, and she is a member of the Osteopathic Cranial Academy and the American College of Osteopathic Family Physicians.